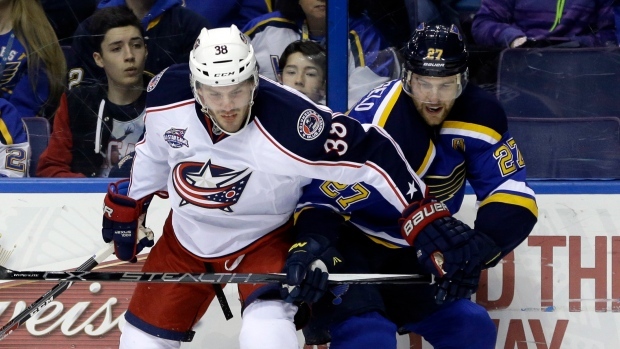 ST. LOUIS - The streaking Columbus Blue Jackets keep finding ways to win against the top teams of the Western Conference. After defeating Anaheim on Tuesday and then Chicago on Friday, the Blue Jackets got goals from William Karlsson, Jack Johnson, Boone Jenner and Cam Atkinson to beat the St. Louis Blues 4-2 on Saturday night. "It's not an easy place to play, especially back to back, both in Chicago and here," Columbus coach Todd Richards said. "It's a good job by the guys. Six periods of, I think, hard hockey where they put it on the line. We weren't perfect, but the compete is there and that's what you want. It leads to the resiliency and finding ways to win hockey games." Sergei Bobrovsky made 29 saves to help Columbus (36-35-4, 76 points) win its sixth straight overall and eighth straight on the road. The Blue Jackets have won nine of their last 10, including three wins in shootouts and one in overtime. "We haven't talked at all or didn't notice that we've had a road streak going," Johnson said. "Really, we've just been talking about winning, trying to keep the winning streak going, regardless of whether we're on the road or at home." Patrik Berglund tied it at 1 in the opening minute of the second period, and Vladimir Tarasenko evened it at 2 with 5:16 to go in the period for St. Louis (46-22-7, 99 points), which was coming off a 3-1-2 road trip. The Blues fell to 24-10-2 at home this season. "I thought the difference in the game was the game was in their end quite a bit, but their ability to defend was greater than our tenacity to come up with loose pucks and score," St. Louis coach Ken Hitchcock said. "They were off back-to-back. If we would have played in the first and second like we did in the third, we could have really worn them down. We didn't play that way." Karlsson gave Columbus a 1-0 lead with his first goal with the Blue Jackets after taking a cross-ice pass from Scott Hartnell and slipping a wrister under the pads of Brian Elliott at 7:06 of the first period. The Blues tied it 52 seconds into the second period when Berglund scored his ninth of the season off a pass from Jaden Schwartz on a 2-on-none breakaway. Johnson put Columbus ahead 2-1 with a power-play goal from just inside the blue line at with 8:21 to go in the period. Tarasenko then tied it a little more than 3 minutes later with a power-play goal of his own, his 36th of the season. Jenner gave the Blue Jackets the lead for good with a tap-in off a nice pass from Ryan Johansen with 20 seconds left in the period. "It was a great goal," Richards said. "Great patience by Jo, and Boone does a good job of opening up and giving him a target and then Jo makes a great pass." Atkinson added an empty-netter, his 20th, with 1:18 left. "I liked the way that we started, as far as our energy," Richards said. "You could see I think the game last night took a lot out of us, I think, on both a physical but also emotional level. We didn't have a lot of gas in the tank in the third period, but the guys battled hard with what they had and found a way to win the game." NOTES: St. Louis F Alexander Steen, the Blues' second-leading scorer, collided with a Columbus player in the first period and did not return (lower-body injury). Hitchcock did not have an update on Steen's condition. ... Blues F T.J. Oshie missed the game because of an illness. ... Blues D Kevin Shattenkirk returned to the lineup after missing 25 games with an abdominal injury. St. Louis D Carl Gunnarsson returned to the lineup after missing two games with an upper-body injury. ... Schwartz played in his 200th career game. ... Columbus announced before the game that F Rene Bourque would miss the rest of the season with a stress fracture in his back.